This study was conducted to determine the catabolism of l-valine in porcine mammary epithelial cells (PMECs) and its role in stimulating protein synthesis in these cells. PMECs were incubated with 0.05-, 0.10-, 0.25-, 0.5-, and 1.0-mM l-valine at 37 oC for 2 h. Cell viability and expressions of α-lactalbumin and β-casein were measured after culture with l-valine for 3 days. l-[1–14C]valine was used to study valine catabolism, whereas [3H]phenylalanine was employed as a tracer to determine protein synthesis and degradation in PMECs. The abundances of proteins involved in the mTOR signaling pathway and the mRNA levels for the related key genes were determined using the western blot and RT-PCR techniques, respectively. Cell numbers and the synthesis of proteins (including α-lactalbumin and β-casein) were greater (P < 0.05) in the presence of 0.5-mM l-valine, compared with 0.05- or 0.1-mM l-valine. l-Valine at 0.5 mM also enhanced (P < 0.05) the production of α-lactalbumin by PMECs, in comparison with 0.25 mM l-valine. 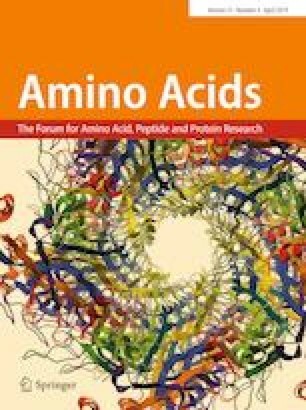 Increasing the extracellular concentration of l-valine from 0.05 to 0.5 mM stimulated protein synthesis in a concentration-dependent manner without affecting proteolysis. Although l-valine was actively transaminated in PMECs, its α-ketoacid product (α-ketoisovalerate) at 0.05–0.2 mM did not affect protein synthesis or degradation in the cells. Thus, the effect of l-valine on protein synthesis was independent of its metabolism to yield α-ketoisovalerate. At the molecular level, 0.5-mM l-valine increased (P < 0.05) the mRNA levels for Ras, ERK1/2, and p70S6K, and the abundances of mTOR, p-4EBP1, total 4EBP1, p-ERK1/2, and total ERK1/2 proteins. These findings establish the critical role of l-valine in enhancing PMEC growth and milk protein synthesis possibly by regulating the mTOR and Ras/ERK signaling pathways. Further studies are warranted to understand how l-valine regulates gene expression and mTOR activation in PMECs. Junmei Zhang, Wenliang He, and Dan Yi contributed equally to this work. This work was supported by Hubei Provincial Foundation of Natural Science (2016CFA070), the Hubei Hundred Talent Program, the National Key R&D Program of China (2016YFD0501210), the Program of National Agricultural Research Outstanding Talents of China (2015), and Texas A&M AgriLife Research (H-8200). We thank our students and technicians for their contribution to this research. This study involved an established cell line. No approval of animal use protocol is required. No informed consent is required for this study.